Bangladeshi police have arrested three people and filed a case against 3,000 villagers after clashes erupted at a protest against a proposed power plant. 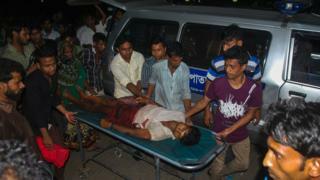 Four people were killed and at least 20 injured as police opened fire at the rally near Chittagong on Monday. Police say they were forced to open fire when protesters attacked them. Protesters fear they will lose their land when the coal-fired plant, funded by a Chinese firm, is built, and say it will pollute the local environment. Bangladesh faces an electricity shortage, but some plans to build new power stations have faced strong opposition from environmentalists, the BBC's Waliur Rahman in Dhaka reports. Police say it is not clear who shot dead the four villagers as the protesters had also opened fire, our correspondent adds. Bangladeshi police accused the villagers of vandalism and assault after the protest at the village in Banshkhali turned violent on Monday. However, some villagers said they had demonstrated peacefully against the power plant for days. One local resident, who asked not to be named, told AFP news agency they feared police would "now use their power indiscriminately against any villager" who spoke out against the plans. The area was tense on Tuesday as police patrolled the area and hundreds of locals staged another protest, calling for justice for the four victims, media reports say.